Camp Timber Tops bunk counselors are our most valuable resource, and they travel to camp early each summer to get to know each other and get ready for campers! Leading by example, our incredible staff members naturally teach Timber Tops girls how to push themselves into finding independence, confidence and personal success at camp. Welcome, Future Camp Families! 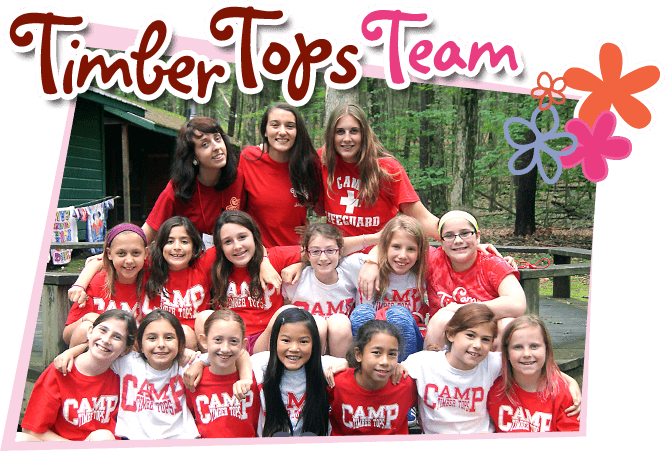 Camp Timber Tops is part of a camp organization that has been owned and operated by our family, the Black family, for over 80 years and 4 generations. It's one of America's oldest camps under continual ownership. Timber Tops' brother camp is Lake Owego and it is affiliated with Pine Forest Camp for boys and girls, started in 1931 by Hughie and Selma Black. Anna Black Morin grew up as a camper at Timber Tops, served as a counselor, activity head, and then head of hi-senior girls. Formerly a middle school teacher in New York City, she currently works as full-time Director. Anna's parents, Mickey and Barbara, are the camp owner/directors and her grandfather, Marvin Black, is one of the Camp Timber Tops founders. Also pictured are Lee Forest Black and Eric Morin, Anna's husband. Anna and Eric met and were married in Greeley, Pennsylvania and now live in Philadelphia with their daughters, Ruby and Hattie. Hi, Everyone! We're the Ruddick Family! My name is Missy Ruddick, but I came to Camp Timber Tops as Missy Miller when I was in middle school. I didn't know anyone when I came to camp that first summer, but I quickly fell in love with Timber Tops and my friends there, and I've been at camp pretty much ever since! I progressed through the ranks as a dance counselor, then a unit leader, a Head Counselor, and now my husband Andy and I are directors! We met at camp more than 15 years ago when Andy was a counselor at our brother camp, Lake Owego. During the year, Andy and and I live in Florida and work as elementary school teachers. We have two beautiful children, Ashley and Nicholas, and the four of us travel up north every year to our summer home in Greeley, PA.
My name is Lauren Miller, but at camp I'm "Millie." It's hard to believe, but I've been spending my summers at Camp Timber Tops for over twenty years! I started as a camper and haven't been able to leave. After earning a BA in Psychology and American Sign Language from the University of Rochester, I moved to Washington D.C. and attended the George Washington University where I graduated with an MA in school counseling. I've been the school counselor at Murch Elementary School in Washington D.C. for seven years, which is great, because I'm finished with the school year just in time for camp! I love running the senior and hi-senior division, but you'll also see me running around the fields and courts at camp. I'll see you down the winding road soon! Hi everyone! I'm Rachel, and I've been at camp since I was ten years old! I first started coming to CTT as a camper, and I always knew that I wanted to return to be part of the staff. I have been a counselor, head of drama, unit leader, and I am thrilled to be Head Counselor of Junior Girls! After I completed my BA in Psychology at Binghamton University, I moved to NYC where I earned my MS in Education from Bank Street College. I am currently teaching elementary school in Manhattan. I love to sing just about as much as I love camp, which works out well because at Timber Tops there is so much singing! We sing about everything from pizza to pool days! I can't wait to see everyone this summer and teach you some camp songs and cheers!